Tarek M. Sardana, CD, MD – Aviation Medicine Intl. Dr. Sardana recently retired from the Canadian Forces (CF) in 2008 after 20 years of service and is currently a member of the CF Supplementary Reserve Force. Dr. Sardana’s last position on active duty was as the Senior Staff Officer, Aerospace Medicine, for the Chief of the Air Staff (CAS). Dr. Sardana was responsible for all aerospace medicine policies and practices, including issues related to aircraft accident investigation and prevention. He also provided expert advice on such issues as aircrew fatigue, hypoxia and neck strain in helicopter and fighter pilots. Before joining CAS in 2005, Dr. Sardana was the Flight Surgeon for the Directorate of Flight Safety (DFS) in Ottawa. Dr. Sardana was responsible for all aeromedical and human factors issues related to CF Flight Safety. Prior to this Dr. Sardana was the Wing Surgeon at 8 Wing/Canadian Forces Base Trenton from 1999 until 2002. Dr. Sardana was responsible for the medical care of CF members and for operational medicine needs of all five squadrons at the Wing involved in search and rescue and worldwide transport, as well as air medical evacuation from overseas back to Canada. From 1997 until 1999, Dr. Sardana completed an Advanced Residency in Aerospace Medicine (RAM) Program with the U.S. Navy at Naval Air Station (NAS) Pensacola, Florida. While in Florida he completed primary flight training and Aviation Safety Officer training and as well he completed a deployment on the USS Carl Vinson where his activities included familiarization with carrier air operations. He also worked with NASA on the treatment of decompression sickness for astronauts serving on the International Space Station (ISS). 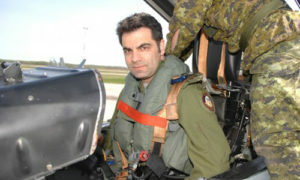 Dr. Sardana served as the Flight Surgeon at 410 Tactical Fighter Squadron at 4 Wing CFB Cold Lake, Alberta where he flew over 100 missions in the CF-18. In 1995, while at CFB Cold Lake, he was deployed for six-months to the United Nations Disengagement Observer Force (UNDOF) in the Golan Heights, Israel. Dr. Sardana was also deployed in 1994 for six-weeks as the Flight Surgeon on OP SCOTCH, the airlift support for the UN mission into Rwanda. Most recently, in the spring of 2004, he was the Task Force Surgeon for three months during OP HALO; the Canadian Forces Mission in Haiti. Dr. Sardana has served on over fourteen aircraft accident Flight Safety Investigations (FSI), he has investigated aircraft accidents and incidents involving gliders, UAVs, helicopters, jet trainers and CF-18’s as well as numerous other minor mishaps and incidents. Dr. Sardana completed his Doctorate of Medicine (MD) at the University of Ottawa in 1992. Dr. Sardana is an Associate Fellow with the Aerospace Medical Association and a member of the International Academy of Aviation & Space Medicine. In addition to being a Canadian Aviation Medical Examiner (CAME) he is a Designated Aviation Medical Examiner (DAME) for Australia and New Zealand. Dr. Sardana is an active pilot with over 500 hours of airplane and glider flying experience. Designated Civilian Aviation Medical Examiner (CAME) for Canada and Designated Aviation Medical Examiner (DAME) for Australia and New Zealand.